We’re here to ensure you have the best transcription experience possible. Yes. Please visit our API page to learn more. We have successfully integrated with a number of companies including Evernote, IPSOS, and Medallia. With a well-documented and robust API, we are always looking to form complimentary partnerships. TranscribeMe provides best-in-class security and confidentiality. Our process of segmenting audio ensures confidentiality by preventing any one transcriptionist from having full access to your recordings. The full recording is only available to our Quality Assurance team, all of whom have signed NDAs. Moreover, TranscribeMe’s platform is built on Amazon Web Services cloud solution – which is best-in-class in regards to data security. TranscribeMe aims to deliver transcripts that are 99% accurate for our Standard and Verbatim services. We have a 2-tiered transcription and review process, ensuring highly accurate transcripts delivered fast. First, your audio is digitally enhanced and sliced into smaller segments using our own specialized software, and then our team of transcriptionists converts your audio into text. From here, our quality assurance personnel review the transcripts before they are sent back to you. To achieve this level of accuracy, we require clear, audible files. If the audio quality is low, or the participants do not speak clearly our transcriptionists will make a best-effort, but the transcript will most likely not achieve the high standard we aim to deliver. To learn more about how we ensure high quality transcription, check out this article. Our First Draft Transcripts pass audio through 1 step of transcription, providing easy-to-read raw text that reaches 90-95% expected accuracy. To achieve this, your audio is digitally enhanced and sliced into smaller segments using our own specialized software, and then our team of transcriptionists converts your audio into text. If the audio quality is low, or the participants do not speak clearly, our transcriptionists will make a best-effort, but the transcript will most likely not achieve the high standard we aim to deliver. Turnaround times depend on the Transcription Type ordered. Our Machine Express transcripts are completed in about 3x the duration of your audio file. So a 10 minute file will take about 30 minutes to transcribe. 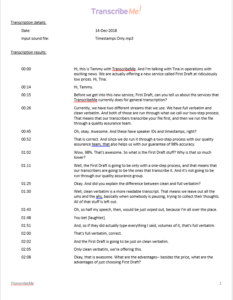 Our First Draft transcripts without timestamps and speaker IDs are usually completed in 1 business day regardless of turnaround selected, or 2-3 business days if you include timestamps and speaker IDs. Our Standard and Verbatim transcripts take 2-3 business days. For First Draft (with timestamps and speaker IDs), Standard, and Verbatim transcripts our turnaround times are applicable for high quality files which are 90 minutes or less. For files between 91 and 149 minutes we ask for 4 business days. Files over 150 minutes will take 5+ business days. Business days are 9am-5pm PST. We offer a rush turnaround service in 1 business day (PST), for high quality audio files that are 70 minutes or less. If you submit low quality audio our turnaround times may be extended. Feel free to contact us if you need rush delivery for files over 70 minutes or have low quality audio. Our First Draft service passes through the initial transcription step, where a team of transcriptionists work on your content in-tandem. This can be returned to you as raw text. We also offer timestamps and speaker IDs with First Draft without the additional layer of editing that comes with our Standard service. First Draft transcripts remove “umms”, “ahhs”, “likes”, “you knows”, and other filler words in addition to stuttering. We do not correct grammatically incorrect language – we transcribe the audio exactly as it is. First Draft transcripts are completed in 1 business day, or 2-3 business days if you select timestamps and speaker IDs. Our First Draft service comes with an expected ~98% accuracy, but it is not guaranteed and will vary based on audio quality. Instructions on ordering our First Draft Service can be found here and you can learn more about the product and connect with our Sales Team here. Check out samples of our First Draft transcripts, compared to Standard and Verbatim here. What is your Machine Express Service? The transcripts are returned with 30 second automated timestamps (to the nearest punctuation mark). We remove “umms”, “ahhs”, and stuttering to improve readability. If you want to learn more about the product or have bulk or custom requirements, you can contact our Sales Team. This product has no accuracy guarantee and refunds will not be provided for accuracy reasons. We suggest purchasing with a short file first to see if it fits your needs. Our Standard and Verbatim products go through both an initial layer of transcription, and then to our Quality Assurance Team to output our guaranteed 99% accuracy. Standard transcripts go through both an initial layer of transcription, and then to our Quality Assurance Team to output our guaranteed 99%+ accuracy. These transcripts remove “umms”, “ahhs”, “likes”, “you knows”, and other filler words in addition to stuttering. Please note that with our Standard service, we do not correct grammatically incorrect language – we transcribe the audio exactly as it is. Verbatim transcripts go through both an initial layer of transcription, and then to our Quality Assurance Team to output our guaranteed 99%+ accuracy. We capture speech exactly how it sounds. This includes all filler words, stuttering and speech errors. First Draft transcripts pass through our initial transcription step, where a team of transcriptionists work on your content in-tandem. Your transcript does not pass through a final editing step like our Standard and Verbatim services. We remove “umms”, “ahhs”, “likes”, “you knows”, and other filler words in addition to stuttering. We do not correct grammatically incorrect language – we transcribe the audio exactly as it is. More details can be found here. Can I see samples of single and multi-speaker transcripts, with and without timestamps? Absolutely! Single speaker transcripts have line breaks when there is a change in thought or topic. Multi-speaker transcripts have a line break each time the speaker changes. If you select to add timestamps and speaker IDs this will be placed at the beginning of the line break, with speakers marked as S1, S2, etc..
We also offer a beta version of Automated Timestamps. This applies a timestamp at each speaker change, or at each thought change (for long monologues or single speaker files) without applying a speaker ID. It is available for English, Spanish, and French. Timestamp accuracy is dependent upon audio quality and is not guaranteed. Learn more. If you select not to have timestamps and speaker IDs, you will only have the paragraph breaks. What is your Automated Timestamps (beta) service? We now offer automated timestamps for $0.10 per minute. It is available for English, Spanish, and French. Select this option at checkout under the “Timestamps and Speaker IDs” menu. This services applies a timestamp at each speaker change or thought change (for long monologues and single speaker files) without having an accompanying speaker identification. Timestamp accuracy is dependent upon audio quality and is not guaranteed. Can I upgrade my completed transcript to get additional features? Yes! Once a transcription is completed it is eligible for an upgrade in 2 different scenarios. If you ordered a First Draft transcript you can upgrade it to our Standard transcription service, which is reviewed by our Quality Assurance Team, and is subject to our 99% accuracy guarantee. If you ordered a Standard transcript without timestamps, you can upgrade it to include the timestamps and speaker IDs. Learn more about our transcription types here and see what a transcript looks like with timestamps here. You will receive an email notification when your transcript is completed, and can download a copy in your Customer Portal Account. If you would like that transcript attached to this email, please follow these instructions. You can also select an NVivo formatted transcript at checkout. You will have both Mac and PC formats of this transcript available. We accept most digital audio formats. These include: wav, mp3, mp4, ogg, aiff, aif, m4a, mov, wma, avi, flv, 3gp, 3gpp, 3ga, amr, caf, m4v, mxf. As a rule of thumb, if you can play a media file on your computer, we should be able to transcribe it. Your message has been sent to our Support Team. We'll be in touch soon.